The Guardians of the Galaxy won’t be returning to the big screen until May, but gamers can enjoy the motley space crew at home a month earlier. Telltale has announced the release date for the first episode in its five part series starring the Guardians. Episode One, “Tangled Up in Blue” will launch April 18th for $4.99 on PlayStation 4, Xbox One, PC, iOS, and Android devices. The season pass for Marvel’s Guardians of the Galaxy: The Telltale Series releases May 2nd in North America and May 5th internationally. 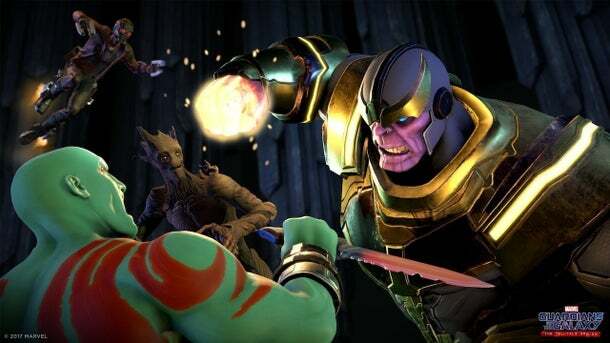 Check out the first look at Thanos in the game below and look for a new trailer coming this Thursday. It’s been awhile since I’ve played any Telltale game and I surprisingly still hear complaints about the developer’s engine. Guardians of the Galaxy is easily one of my favorite Marvel films and if the reviews are solid I see myself picking up the game down the line. Previous PostMONG Plays Spider-Man – Episode 1Next PostMONG Podcast 159 | Hats Off to Ya!